These lessons give you and your child or student a bird’s-eye view of predator-prey ecosystem models. 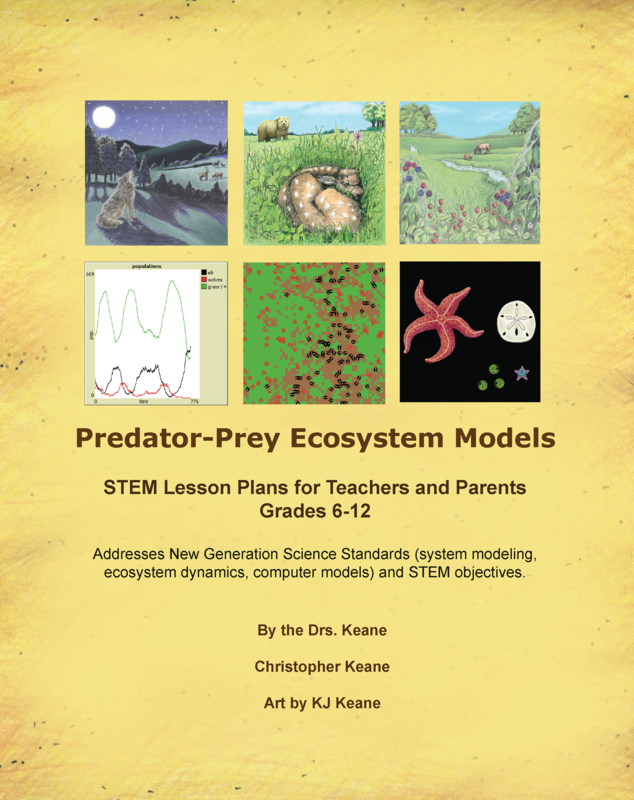 The topic of our systems modeling in these lessons is predator-prey dynamics, but students also will learn about systems modeling generally. This comes free with your subscription to us. Also available on Amazon and Kindle. The New Generation Science Standards (NGSS) emphasize system modeling as a crucial skill, and include ecosystem dynamics as an important example. Systems modeling incorporates science and math, but does not focus on isolated scientific facts or rote learning of math. Our systems modeling approach emphasizes how parts interact to create a working whole, and shows how a whole complex system is more than the mere sum of its parts. Easy to learn computer coding directs how the system model parts interact. We use system modeling graphics and creative art to visualize the interaction of parts within the whole. Thus, our approach naturally integrates science, math, and art as well as system modeling to meet STEM, STEAM, Common Core, and NGSS objectives. The lessons have accompanying computer models, which you can use through a web browser. Although these models are easy to use, the learning can go ever deeper. All ages will get a big picture perspective of fascinating social and ecological dynamics affecting the health of our world. Included is an outdoor wondering exercise, which stimulates or reinforces critical thinking, a “wondering why” and a sense of awe. We aim to help you and your student soar to new perspectives and better appreciate the awesome interactions in our world.